Like other arachnids, scorpions need to molt their outer skins -- exoskeletons -- periodically as they grow, usually about six times during their lives. Under no circumstances should you handle or disturb your scorpion at this vulnerable time, but there are a few ways to help ease the process. Most importantly, ensure that she can’t be damaged. Before the scorpion’s outer surface starts to crack, your pet will show certain signs indications that molting is about to begin. Usually, she’ll lose her appetite, something that can happen weeks or even months beforehand. Closer to the time, she might sit absolutely motionless or take refuge in a shelter. The molting process begins with the outer skin, cracking and opening up. The scorpion works her way out, leaving the shed skin behind, which looks somewhat like a dead scorpion. At this point her new exoskeleton is very soft and delicate. Over the next few days, it hardens until it's as tough as before. As soon as you suspect your scorpion is about to molt, remove any live insects from the tank. 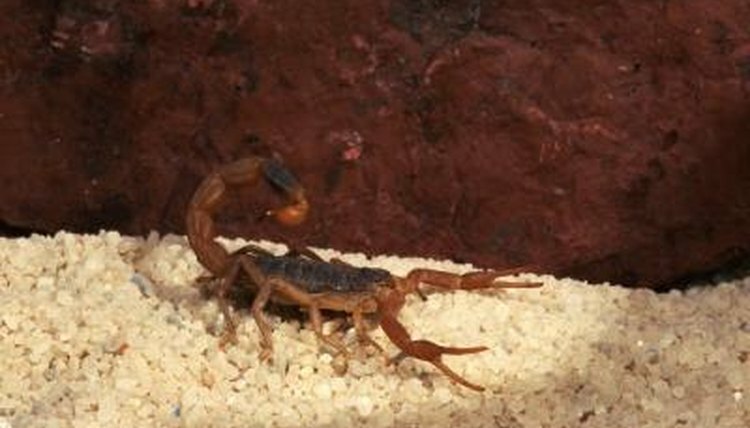 It's imperative not to handle or feed your scorpion until the molt is over and she has fully hardened. A cricket or roach could seriously damage her at this time. The same goes for other scorpions -- if she has friends, move them, not her, to another tank. Misting to increase the humidity in the tank softens the old skin, helping the molting process. This is especially important for juvenile scorpions. Also consider adding a humidity box, which is basically just a plastic box lined with damp paper that allows the scorpion to select a damper spot when she needs one. Cut a scorpion-sized doorway in the side and pop it in the tank. Obviously, only use dechorinated or spring water for misting and in the humidity box. A molt can go on for a long time, sometimes for 10 hours or more. This isn’t necessarily a problem, but if molting has been going on for a day or more and your scorpion appears to be stuck, it’s time for action. Unless you have considerable experience with arachnids, don’t try and help the scorpion yourself as you could cause serious damage. Instead, take the tank complete with scorpion to a vet or other expert for assistance. To find somebody who could help, ask a reptile and arachnid supply store, zoo or local arachnid club for recommendations.